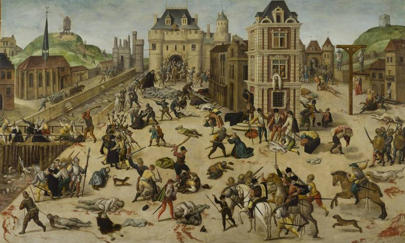 The Massacre on Saint Bartholomew's Day (c. 1572-1584), from Musée cantonal des Beaux-Arts de Lausanne. This painting of the Saint Bartholomew’s Massacre dates from sometime between 1572, the year of the massacre, and 1584, the artist’s death. The painting shows the chaos of the scene with numerous vignettes of violence, murder, and death. The body of Coligny, the Protestant Admiral whose attempted assassination sparked the unrest that led to the Massacre and his eventual death, hangs from a window. Catherine de Medici is shown dressed in black exiting her castle to inspect the bodies. The scene lacks one focal point, to emphasize the confusion and chaos of the scene. 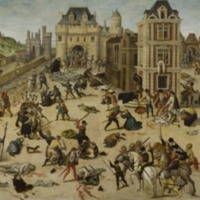 Francois Dubois (1529-1584), “The Massacre on Saint Bartholomew's Day (c. 1572-1584), from Musée cantonal des Beaux-Arts de Lausanne.,” Medieval Hollywood, accessed April 19, 2019, http://medievalhollywood.ace.fordham.edu/items/show/21.